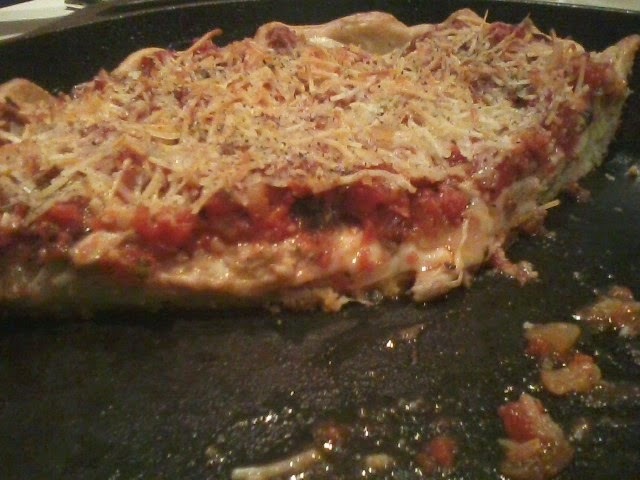 If you asked me what my favorite style of pizza is, it would not be deep dish. I am a true die-hard Chicagoan who loves thin crust pizza...the thinner the better. That said, every once in awhile, I like a pizza with a little more beef to it. 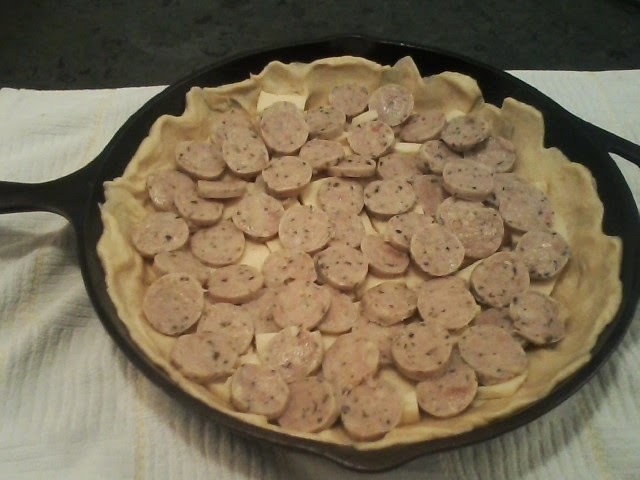 I bought a cast iron pan, watched Lou Malnatti in a battle with Bobby Flay over the best deep dish pizza about a dozen times, and voila....a great knockoff. The prep work is what takes the most time here, but once you have everything ready, it comes together very quickly....the biggest expense is a cast iron pan. 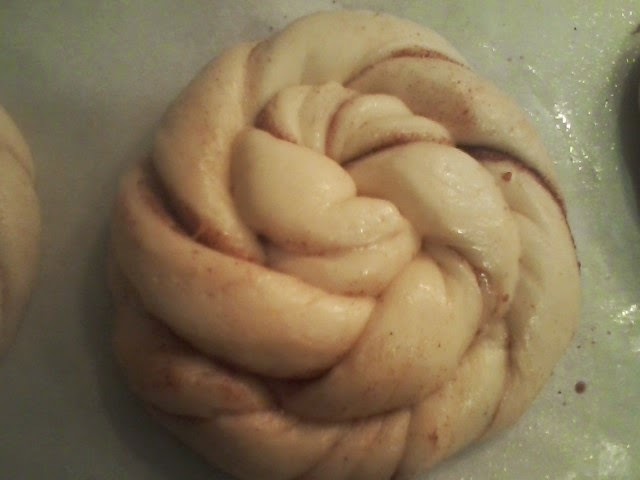 In your mixer bowl, Kitchenaid preferably, with the dough hook, dissolve the yeast in the water. 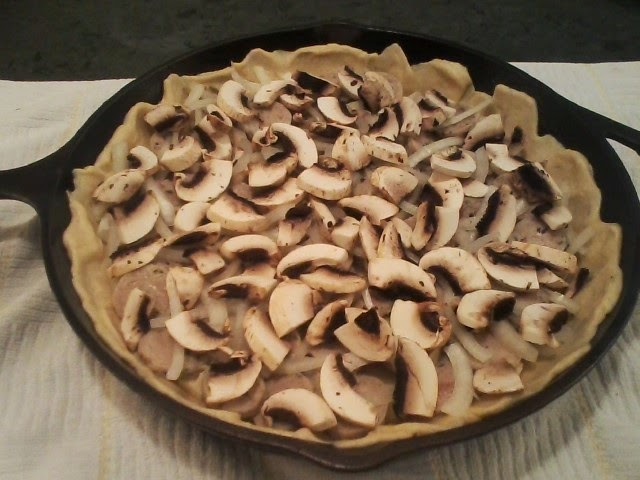 Add the oils, cornmeal and the flour. Beat for about 10 minutes. Use a large rubber spatula to help it along. 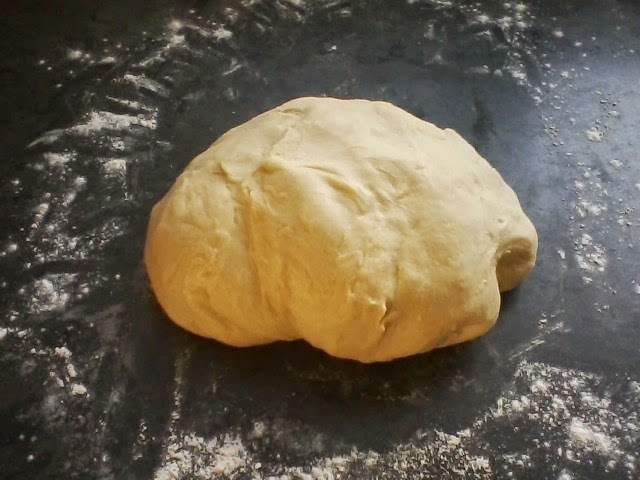 Dough should be elastic and soft, but not overly soft. 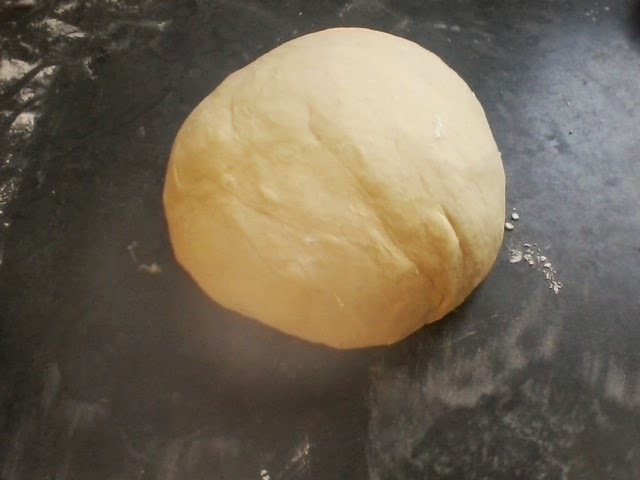 Put dough in large greased bowl and cover with plastic wrap. Allow to rise until double in bulk. I put the bowl in my oven that I heated to 180, then turn off. Punch down and allow to rise again. 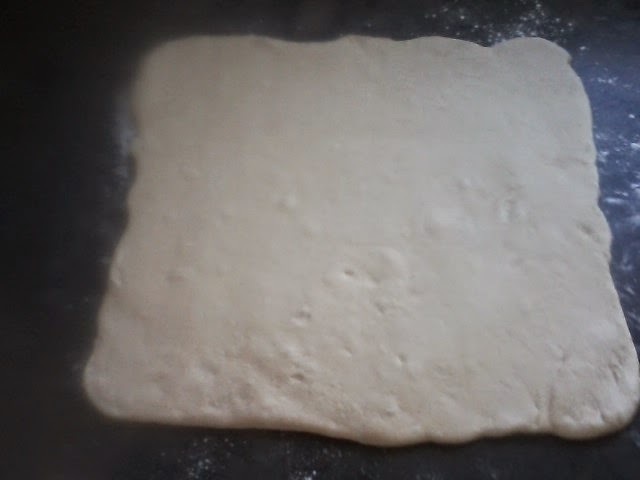 Punch down a second time and the dough is ready to make pizza. 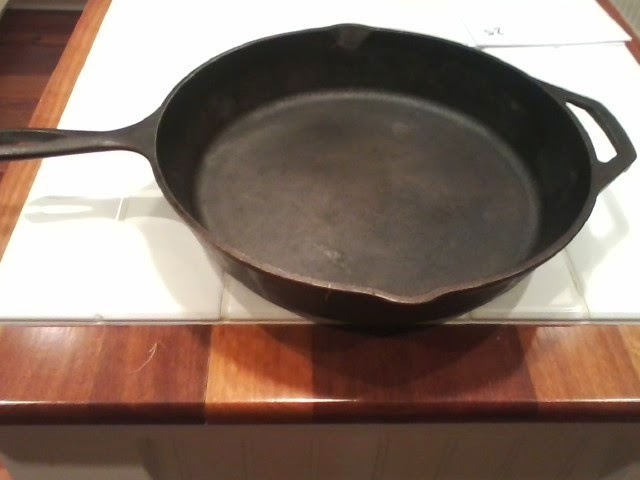 Grease a 12" cast iron pan...if you don't have a cast iron pan, a oven-proof pan will do. * I sometimes buy Italian sausage already cooked, then just slice it. If you buy raw, you can cook and then slice it, or buy bulk and crumble it up while cooking. **you want to make sure your sauce is nice and thick...you may want to put in a large sieve over a larger measuring cup so the excess liquid drains off. 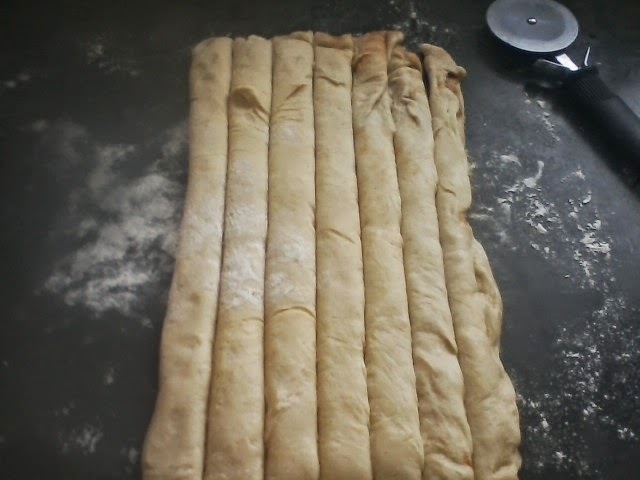 Heat oven to 325 and line two large baking sheets with sides with parchment paper. In small saucepan, heat the oil, honey and maple syrup on low just for a few minutes. 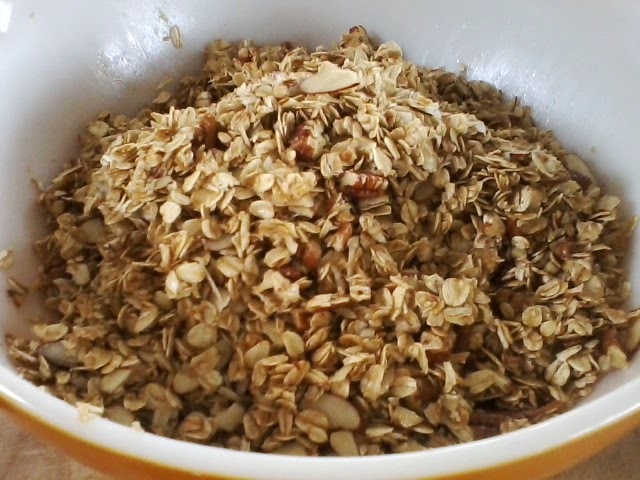 In a large bowl, add the oats, almonds, sunflower seeds, pecans and both brown sugars, (see below). I mix with my hands. Add warm honey, syrup and oil into dry mixture, and mix with hands until well incorporated (this also feels great on your hands). 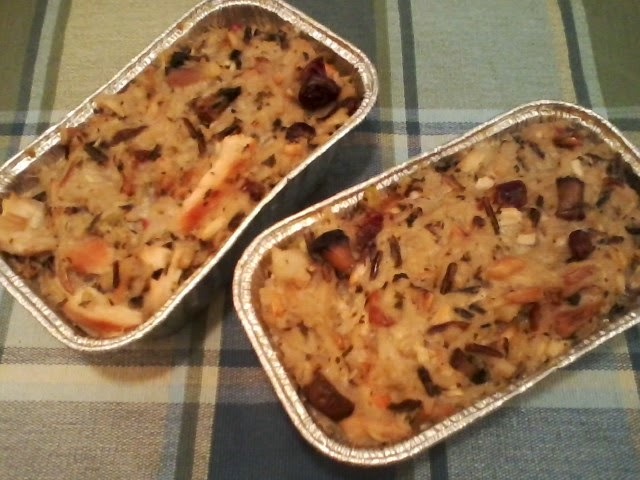 Spread mixture between two pans, (see below) and place in oven, baking for 40-45 minutes. 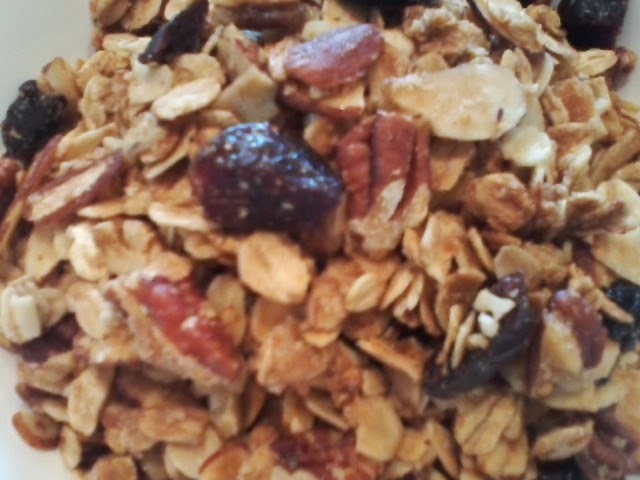 If you want chunky pieces of granola, do not stir, just bake. 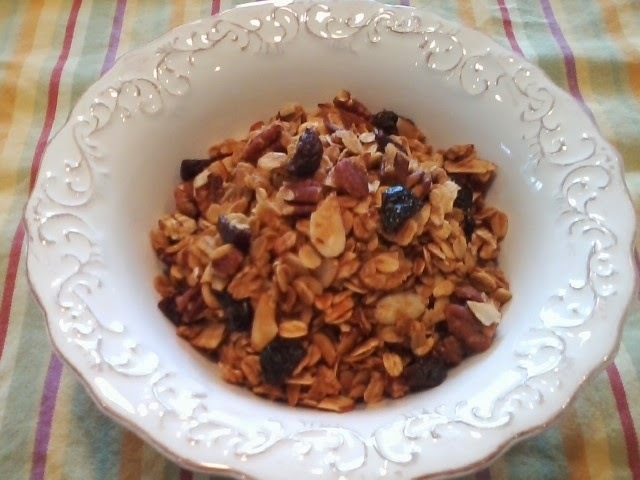 If you want a loose granola, stir 2-3 times during baking to make sure everything is baking evenly. 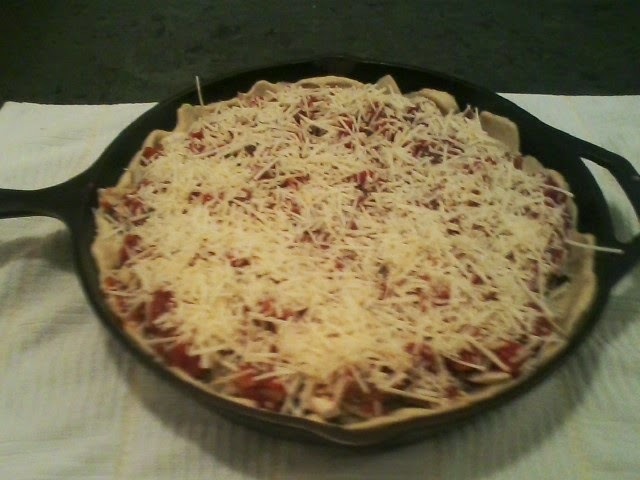 Remove from oven and cool on sheets. 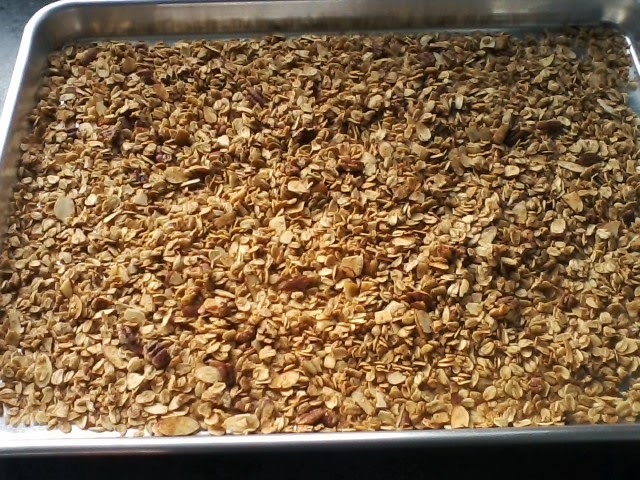 For chunky granola, let cool a little on baking sheet. 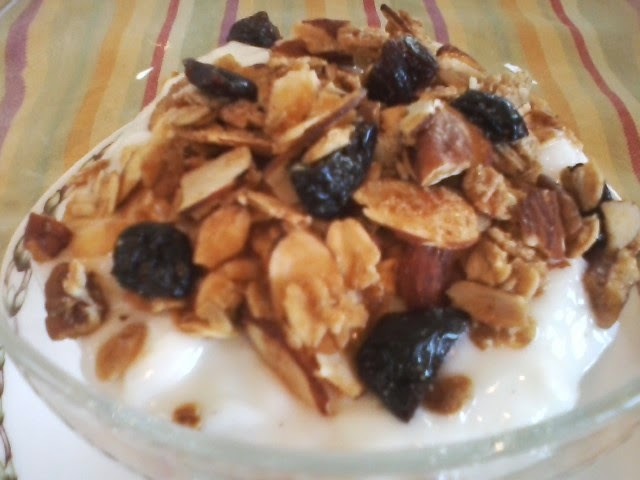 Place granola in a large bowl, add fruit, and stir. Place in a tight container. 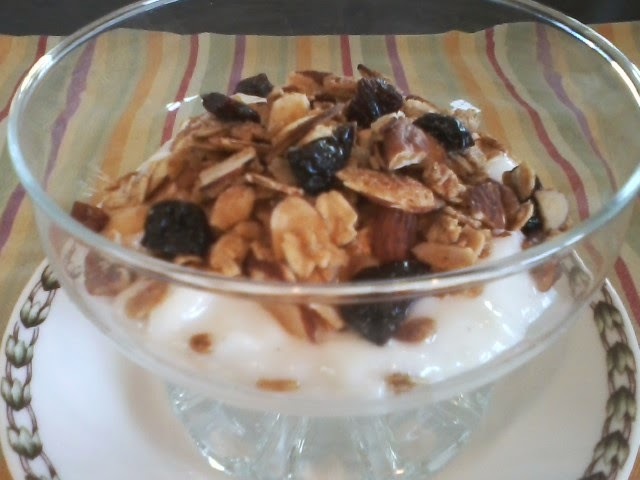 Should be eaten within 2-3 weeks, but trust me, it goes down real easy with milk or on top of yogurt. Bon appetit! 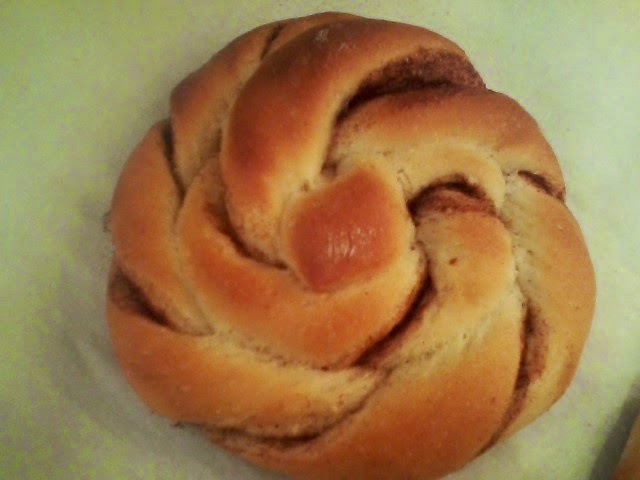 I'm a sucker when it comes to any type of Danish...eating it, that is. 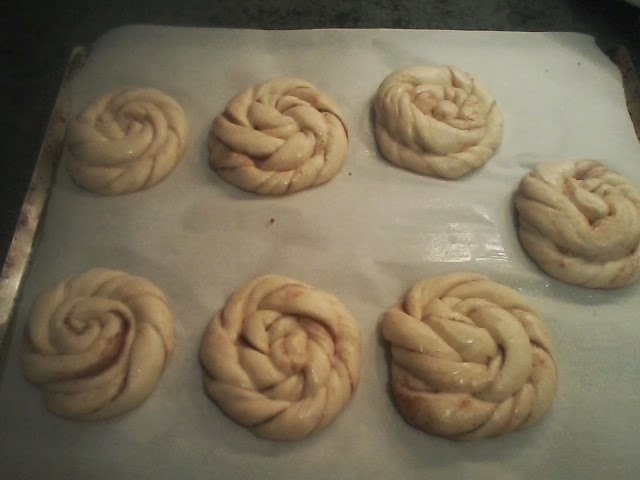 Making a good Danish is a tedious process at best, and sometimes the results are not worth all the ingredients, two rises and prep work. 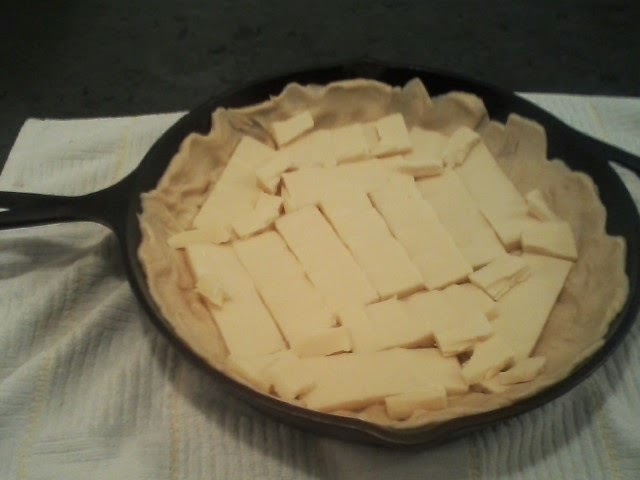 This recipe is the longer version...I will also be posting one where I have cheated and started with one of my favorites...puff pastry dough. I'm sure some of you will look at the recipe below, and promptly say "forget it!" I don't blame you, but then you don't have the benefit of enjoying these wonderful delights. Beat sugar, butter and salt in a bowl with a mixer (I use a hand mixer for this). Add the warm milk and after adding, mixture should be pourable, not spreadable. Add more milk if you need to. 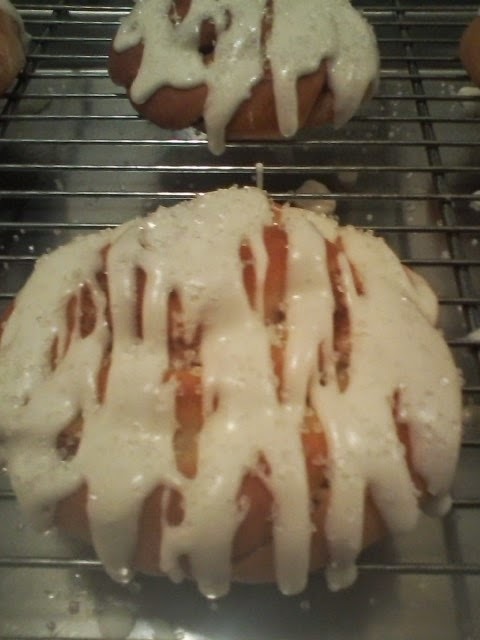 Spoon glaze over rolls a few minutes after they come out of the oven. 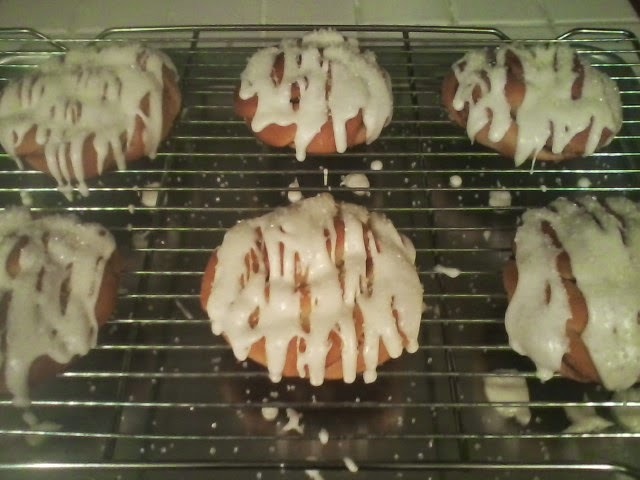 You can top with sanding sugar, or sprinkles, or nothing...bon appetit! I have always loved corn...canned corn, creamed corn, frozen corn, corn on the cob...I love it all. That said, I also love bacon...fried bacon, bacon sandwiches, bacon and eggs. I have made this recipe many times over, tweaking it so it was just right. 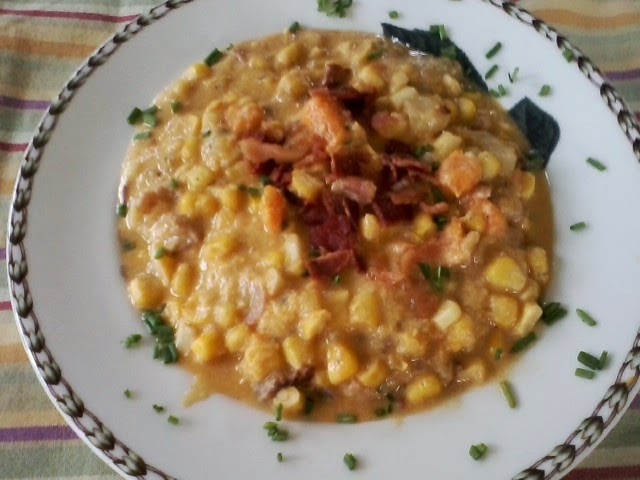 The first time around, I thought using the same proportion of bacon to corn was going to work out great, but the bacon really overpowered the corn, (how could that be?) and corn is really the star of the show. 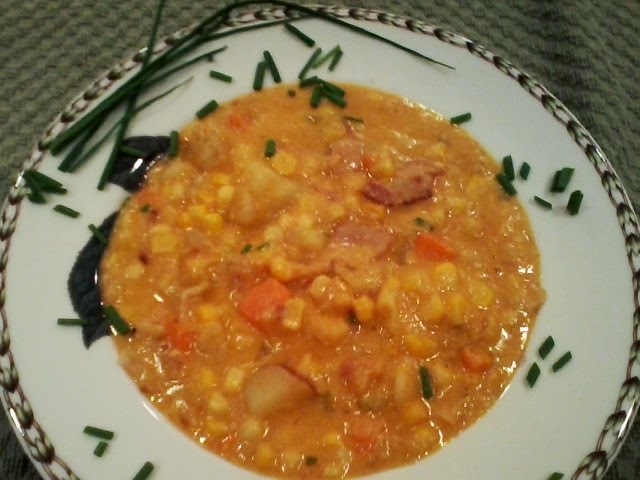 Also, a corn chowder recipe usually calls for red potatoes. In my recipe, I use a combination of red and sweet potatoes, and the sweet potato gives another sweetness aside from the corn. The longer you cook this soup down, the thicker it will be. And yes, you can absolutely use frozen corn. I like to use fresh, because it's fresh. That's not to say it's always the best, depending on the year. Enjoy! 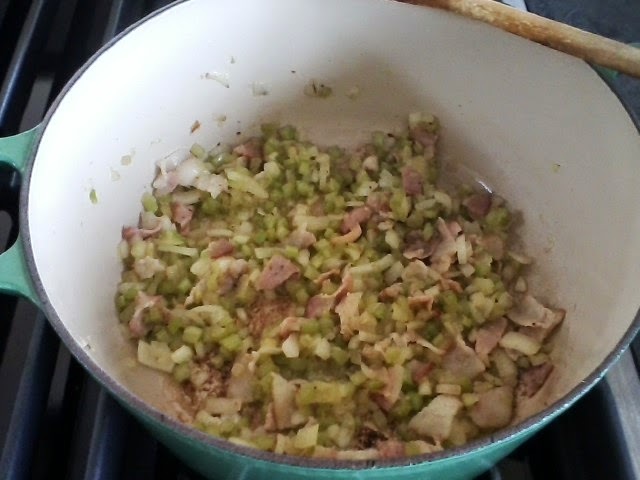 In large dutch oven, saute onion, celery and the 2 pieces of bacon in the olive oil for about 8-10 minutes, or until softened and turning translucent. 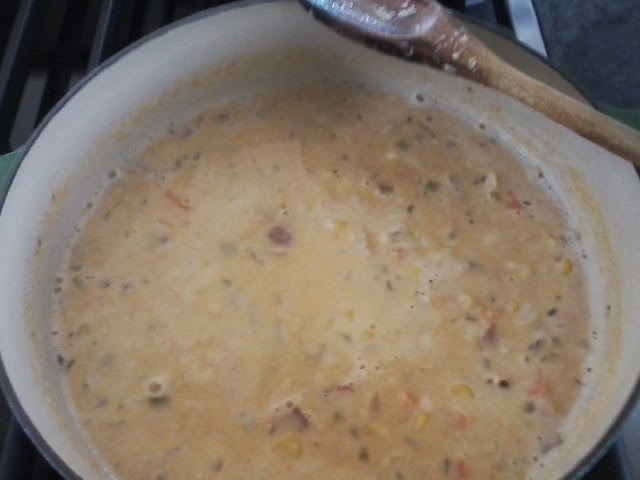 Add corn, potatoes, stock, salt, pepper and paprika. Cover and bring to a boil. Reduce heat and simmer on medium-low for 15-20 minutes, until potatoes are fork tender. In a food processor (I use my nutri-bullet) puree 1 cup of chowder with the tbsp flour. 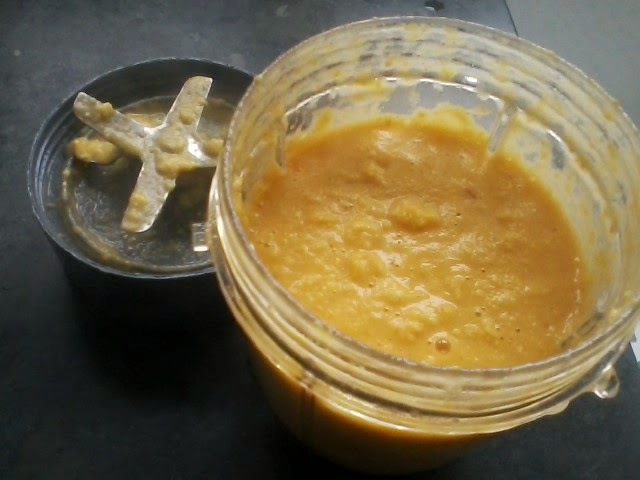 Whisk pureed mixture back into the chowder. Add half and half (or milk), thyme and chives. Simmer, uncovered, for another 10-15 minutes, or until the chowder is the thickness that you like. Crumble the 6 pieces fried bacon into the soup and give it a stir. Bon appetite! 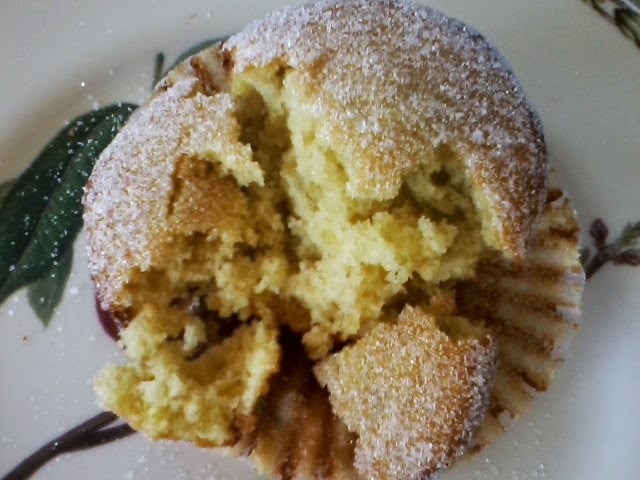 I first had these muffins at the Boardman House, a lovely B&B in Townshend, Vermont, probably 15 years ago. Boardman House is right on the green, surrounded by a gazebo, church, general store and a few lovely houses. The setting is, of course, Americana at its best. Sarah runs the B&B, and is an excellent host, cook and baker. When she had this recipe out the night before, I was rather perplexed by the use of ginger and lemon together, but the flavors really work. 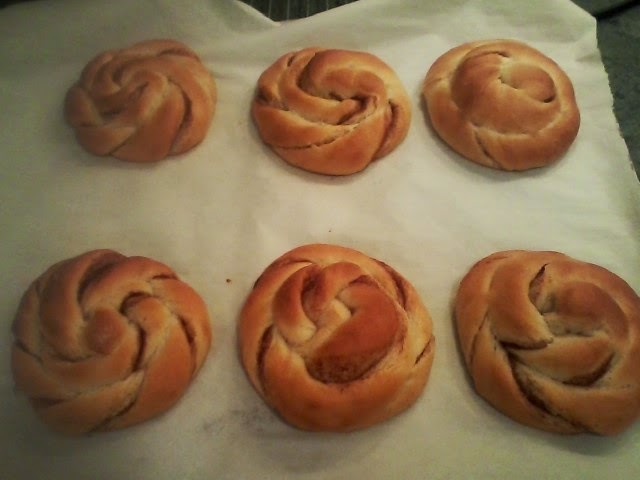 I have made these again and again, as they are simple, and not overly sweet or rich. Over the years I have stepped up the recipe a bit by also adding ground and crystallized ginger. You may think that's an abundance of ginger, but it doesn't overpower, and along with the lemon zest, becomes a muffin with the most delicate of flavors. The finer you chop the crystallized ginger, the less distinct it will become. Preheat oven to 375. Grease 12 cup muffin tin and an extra muffin tin (this makes 13...I tried 12 but the muffins baked over the side of the tin, making it hard to get them out) or line with cupcake liners. Cut the fresh ginger into large chunks. Chop fine in food processor (I use my mini Kitchenaid). Scrape ginger out and put into a small skillet along with 1/3 cup sugar. Cook over medium/low heat until sugar has melted and mixture is hot (a couple of minutes). Remove from stove and let cool. Put lemon zest, crystallized ginger and 3 tbsp sugar into ginger mixture. Stir and set aside. 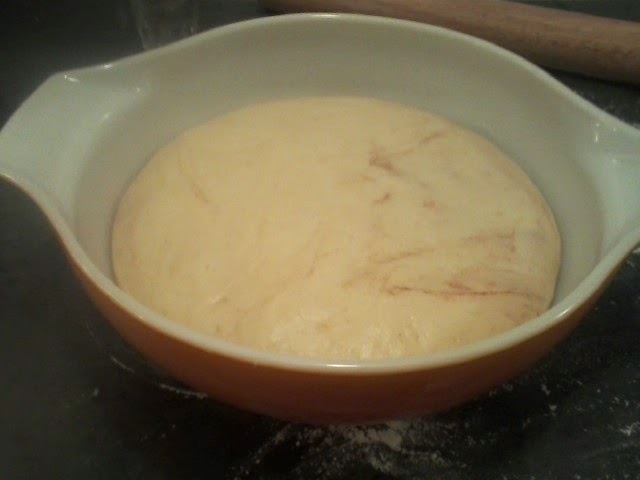 Place butter in mixing bowl and add remaining sugar. Beat until smooth. Add the lemon/ginger mixture, then the eggs, one at a time. Combine flour, salt and baking soda in a bowl. Add alternately with the buttermilk mixture, ending with the flour. Beat just until the whole thing comes together. Fill 13 cupcake cups evenly (I use a scoop to start with). Bake 15-20 minutes, or until a toothpick comes out clean. In a small bowl, put a few scoops of sugar. As quickly after you get the muffins out of the oven as you can, release them from the tin and rub face-down in the sugar (this may take a few minutes depending on how much heat your fingers can stand). 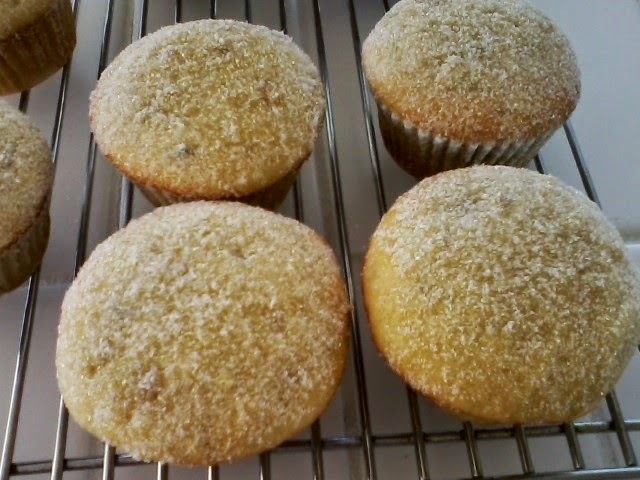 Place muffins on cooling rack. Bon appetit! Recipe #58: Morton's Caesar Salad Dressing...Look Ma, No Eggs!!! * I use one tube Napoleon brand anchovy paste. Pictured is reese, but not all grocery stores carry Napoleon. It is, though, by far, the best anchovy paste. Yes, you use the whole tube, as the flavor is not as sharp as anchovies themselves. 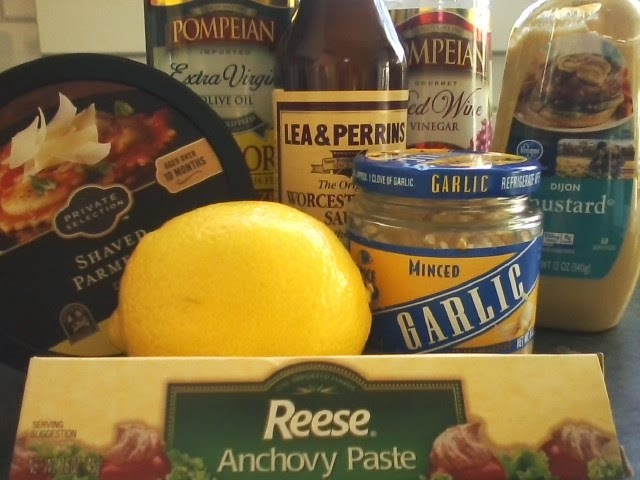 ** I also add the Worcestershire which is not in the original recipe. It is, though, part of a traditional Caesar dressing. *** This recipe makes enough salad to use 2 heads of romaine, although the original recipe calls for only one. Blend all ingredients except for parmesan and romaine in a food processor or blender. Add the parmesan and blend for another minute. Place lettuce in a large bowl and add just enough dressing to coat the romaine. Do not overdress. 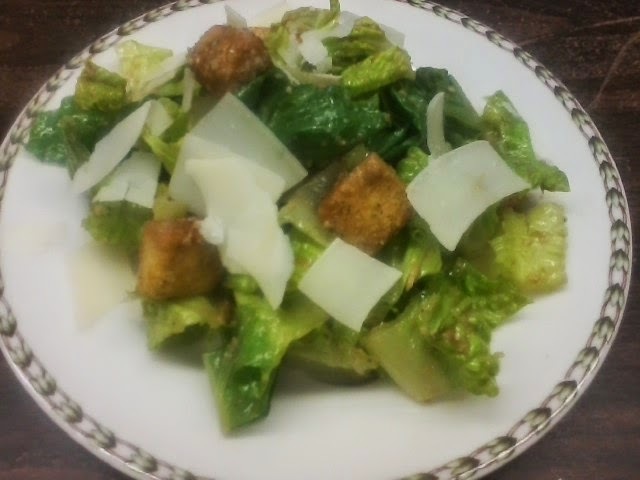 Top salad with croutons, fresh cracked black pepper and more parmesan. Bon appetit! Preheat oven to 350. Grease a 9x13 pan or something of about the same size. 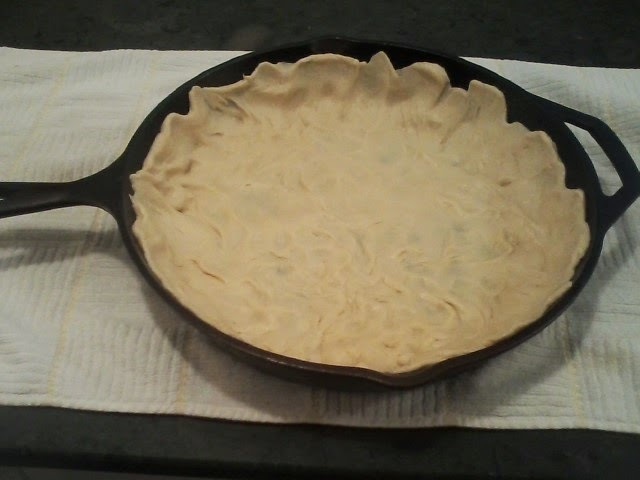 Melt 4 tbsp butter in a large skillet. 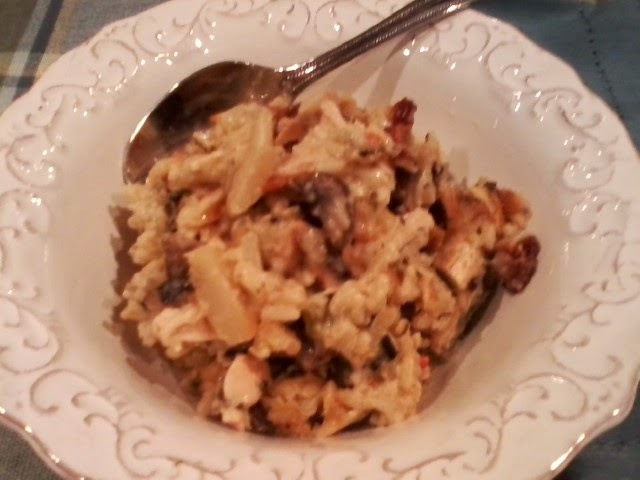 Saute the mushrooms until tender, and then put juice and all in a bowl. 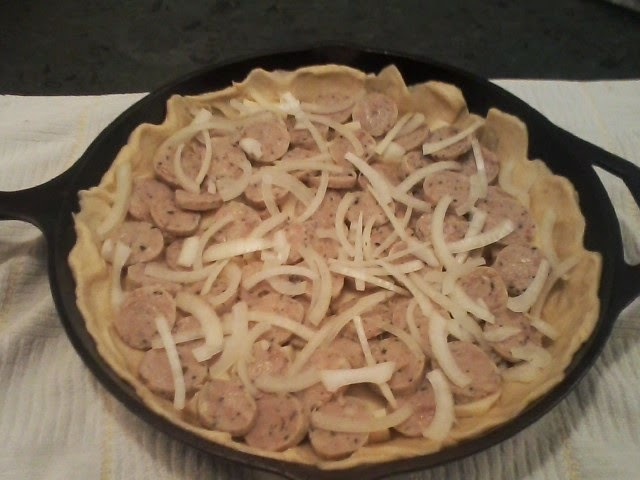 In the same skillet, melt the stick of butter and saute the onion until tender. 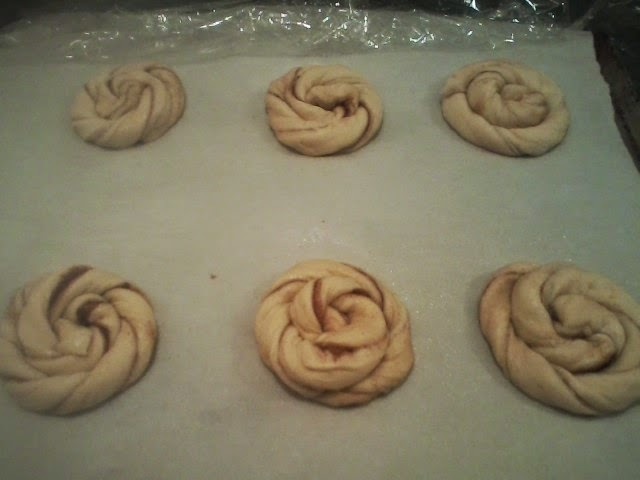 Stir in the flour, cooking for 2-3 minutes, or until all the flour and butter are incorporated. Slowly add the 3 cups of chicken broth into the flour/butter mixture, stirring the entire time. 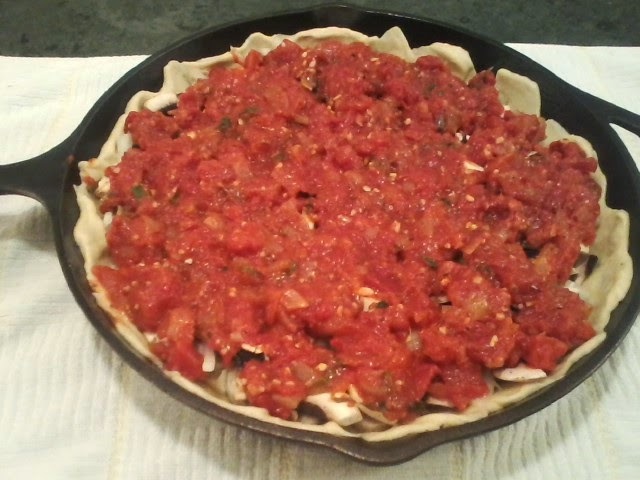 Add the half and half and cook until the mixture is thickened. I use a whisk to make sure the white sauce, which this really is, does not burn on the bottom of the pan. After the mixture is thickened, add the white wine and stir. If your pan is large enough, you can proceed, but I dump the whole mixture into a very large bowl. 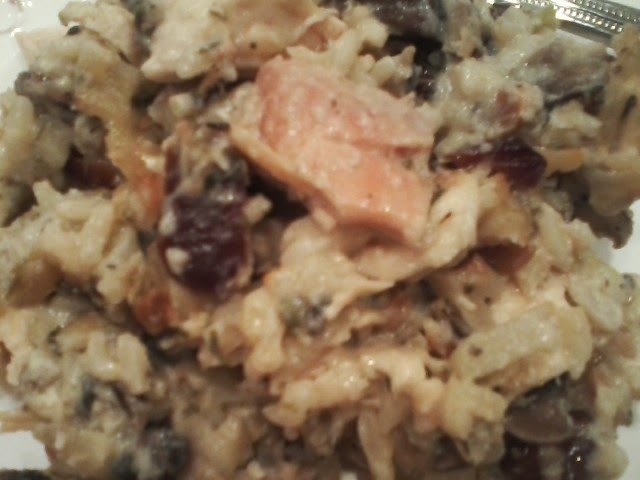 Add the mushrooms, chicken, rice, toasted almonds, salt, water chestnuts and dried cherries. 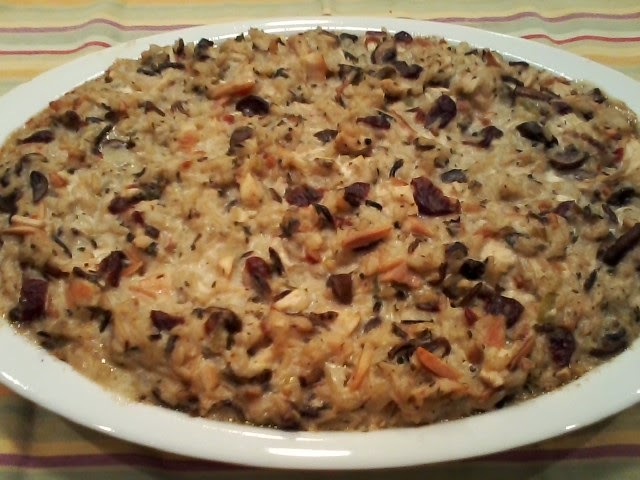 Mix well and then pour into the prepared casserole. 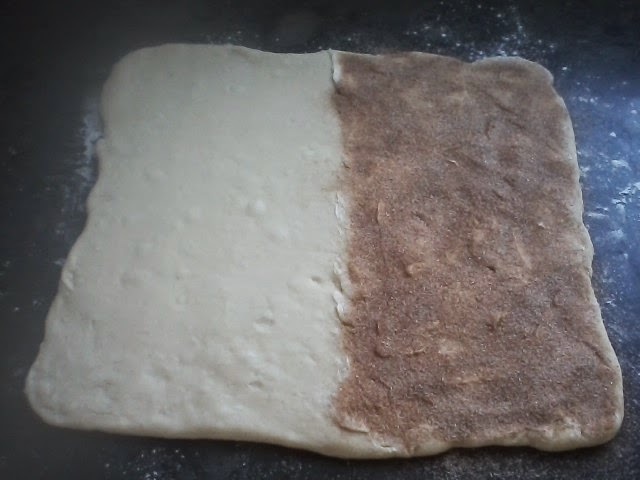 Bake uncovered about 25-35 minutes, or until the top is just starting to brown. You don't want the casserole to be dry, so if not sure, err on the side of the casserole being too creamy...everything is already cooked anyway. Bon appetit!